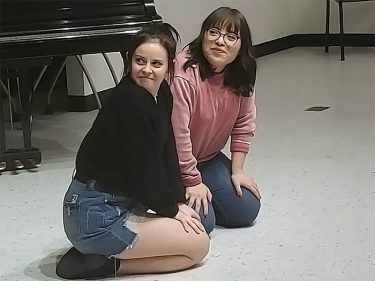 Grand Canyon University sophomore dance major Sidney Williams (left) “lifts weights” at an improvisation workshop on Saturday helmed by members of The Second City Touring Co. 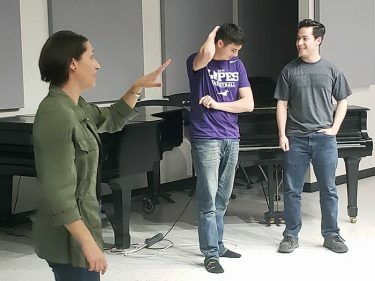 The Second City Touring Co.’s Julie Marchiano and Charles Pettitt, who recently performed “It’s Not You, It’s Me” at Phoenix Theatre, give students improv pointers. It was just one in a slew of exercises Grand Canyon University students dove into on Saturday in the College of Fine Arts and Production Building as part of an improvisation workshop taught by the cast of “It’s Not You, It’s Me” from The Second City National Touring Co. Four cast members — Julie Marchiano, Charles Pettitt, Amanda Blake Davis and Tim Stoltenberg — took time out from their performances at Phoenix Theatre to help Lopes hone their performance craft. The game: One student suggested a character that their improv partner had to create. On the spot. In a few seconds. Right then and there. “Is that a character you would normally play?” Marchiano asked. “Would you say you know a lot about World War II?” she asked one Lope, who brought to life a World War II veteran during the exercise. “I feel each of us was actually given a character but also a problem,” another student said. Just down the hallway, a second class of student improvisationists barked out an activity to a student who had to keep a particular motion going on for three or so minutes. Fellow students then jumped in to improvise a scene, but they had to take that movement and turn it into something else. 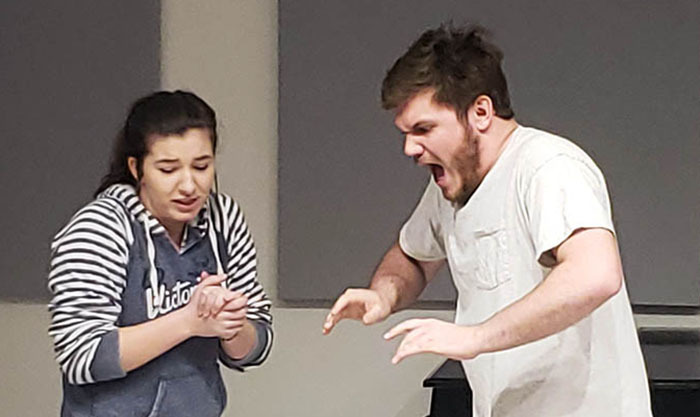 GCU Parables troupe actor Gavin Harris (right) reacts with feigned disgust during an improv exercise. “Hacky Sack!” someone in the class piped up as the student in the spotlight asked, “Wait, what’s that?” before pretending to kick a small sand-filled bag into the air over and over again, not allowing it to fall to the ground. “When they said Indian fire walking, I was, like, ‘Sure!’” said the student in the spotlight. Minutes later, another student took center stage, pretending to lift weights when another student improvisationist joined in, copying the weight-lifting motion and saying, “Boy! This concert is great,” changing the movement in the minds of those watching from weight lifting to concert cheering as the rest of the class laughed. 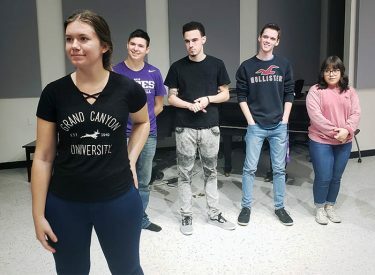 The improvisation workshop, which included about 30 students, was arranged by GCU theatre instructor Michael Kary, who met The Second City cast at a workshop in Peoria and invited them to campus. “This is the first time The Second City has come out,” Kary said of the comedy club and school of improvisation known for churning out comedy greats such as Mike Myers, Stephen Colbert, John Belushi, Tina Fey, Steve Carell, Jordan Peele and Dan Aykroyd, to name a few. 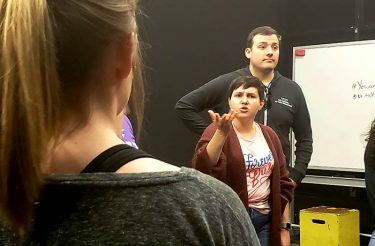 In addition to throwing themselves into almost two hours of improv exercises, they spent some time asking the actors, all alumni of The Second City location in Chicago, about the art of improvisation, their careers, and advice about working in the entertainment industry. Amanda Blake Davis of The Second City Touring Co. (left) gives students feedback. Davis said she landed her first writing job in L.A. by writing Bugs Bunny cartoons, something she never imagined she’d do. But her improvisational abilities got her the gig, which led to other jobs in the industry. The cast also gave students insight on where to pursue their careers. Chicago is a good place to get your footing onstage as a theatre actor and it’s cheaper to live there. If you’re set on TV and film, head to L.A. and know that nepotism “is a thing that will get you one of your first opportunities,” Pettitt said. 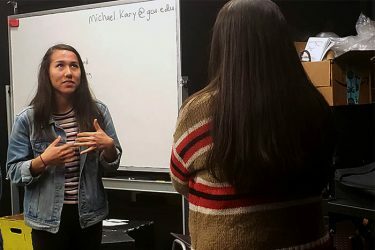 They also suggested Atlanta, which is “blowing up with TV and film right now,” said Marchiano, as well as Austin, Washington, D.C., and Boston, though Pettitt also added that one of your best resources is your local community theatre and local improv troupes as you start building a career in entertainment. Theatre student Christina McSheffrey (left) has just just a few seconds to create a character. “But you can also be in Tyler, Texas. They have an improv team there, and I’ve seen them perform. Just explore as many resources as you can,” Pettitt said. Her favorite exercise was working in pairs. 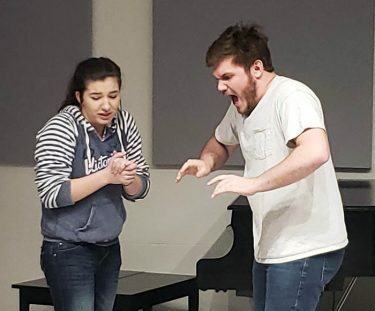 “It was really fun just getting to build off another person,” said Batres, who spent some of her improv workshop time improvising a shoe-cleaning scene. His plan was to audition for the University’s own improv troupe, the Cantalopes. Garrett LaPorte, a senior studying history and secondary education, also applied to be part of the Cantalopes. Although he’s a history major, LaPorte said he’s not new to the stage. 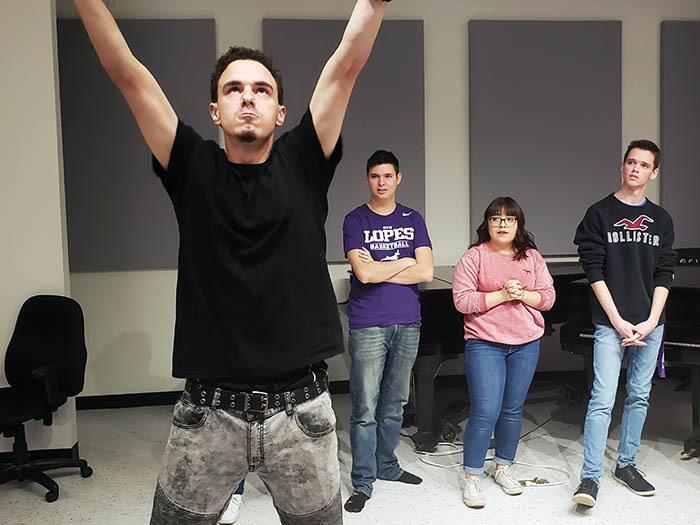 He acted as a child, was in several high school plays and was in theatre at his previous college, Citrus College in Glendora, Calif.
Students line up for an improv exercise. LaPorte said he learned a lot from the after-workshop question-and-answer session with The Second City team.